Great Food Supermarket contains special offer all time. This store on your service at Victoria park ave in Toronto. If you really like Asian supermarkets , you will be satisfied with it ! Their special days are perfect. Sometimes you can see special, traditional product on shelves. Also part of bakery is quite nice. They are producing daily and you can buy fresh bakery produce every day. Don’t have time to prepare something? Don’t worry, visit a their store and take away your bakeries. You can combine Asian yogurt with bakeries too. 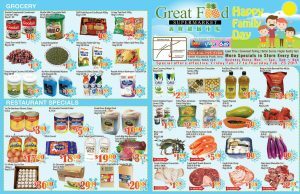 For more information, you can check Great Food Supermarket Flyer. 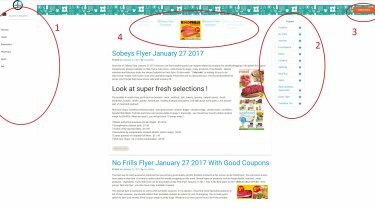 Last 2 days to benefit advantages of Great Food Supermarket Flyer February 21 2017. Let’s browse their fresh selection and benefit their fair prices on this week. Before you go to their stores , first you should make a shopping list and get your essentials ! In this flyer seafood , vegs, fruits, meat and dairy products waiting you at reasonable prices. Also restaurant specials looks good. If you are owner of any place, you can want to buy these products. Jumbo size onions, sauces, carrots, eggs and XL oils good for long term. This store is greatest way to save your money. In meat and seafood category, healthy deals always on. Season is doesn’t matter in Canada. They bring perfect seafood every week. Also Halal products available in store you can find easily them. For more details , deals , discounted products and information , look at this flyer ! You will reach whatever you need related to regular foods. Enjoy !